USA Today reports that airlines are slowly but surely reducing the number of first class seats available, in response to consumer demand for cheaper coach seats. “The global slowdown has put a damper on first-class flying as fewer corporate travelers can afford $15,000 seats,” USA Today‘s Roger Yu writes. Yu mentions several airlines in particular, including AirTran, which will see its first-class product disappear when the airline is absorbed by Southwest, and United, which Yu says has been reducing first class since 2007. Yu says United removed about 20 first- and business-class seats from its Boeing 747s, and added 70 more economy seats. United may drop first class entirely when it merges with Continental, which only flies business and coach. “As high-paying customers dwindle, intense competition for them has forced airlines to spend more on premium service,” Yu notes. “Lie-flat seats are now common in many business-class cabins, further blurring the distinction between first and business class.” These improvements to business class mean airlines operating three tiers of service can ditch traditional first class, and use that space to add more coach seats. Alternatively, airlines can effectively make business class the new first class, and add a premium economy class, which offers more space and comfort than coach but costs far less than business class. For budget travelers, this shift is a mixed blessing. On one hand, trading first-class seats for coach creates more capacity within most consumers’ price range, meaning passengers will have more options on carriers making this change. 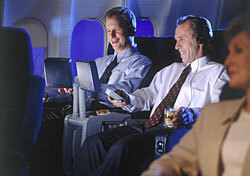 However, the move may put pressure on airlines to nudge coach prices up. First-class seats are far more lucrative than coach, with fares often topping $10,000. That’s a lot of revenue to give up, and airlines will likely need to replace it somehow. But with business travel lagging and demand for leisure travel strengthening, airlines probably see more benefit in packing coach than in selling a few upper class seats. For now, at least. Readers, do you think ditching first class will benefit the majority of travelers? Should more airlines follow suit?